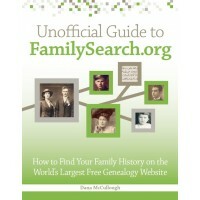 I’m excited to announce that the book I’ve been working on for the past few months, the Unofficial Guide to FamilySearch.org, is now available for pre-order on Amazon.com and ShopFamilyTree.com. Writing this book has been an amazing process. FamilySearch.org has always been my go-to website for researching my family history—it’s the world’s largest free genealogy website. Through my research for the book, I’ve not only honed my searching skills on FamilySearch.org, but I’ve also found new genealogy records for my family that I didn’t have before. It also opened up new research avenues. For example, when I input individuals on my family tree, research hints suggested additional records on FamilySearch.org that may list each of those people. In addition, many individuals at FamilySearch patiently and thoroughly answered the many questions I sent to them, and helped give me great information on the functions and features they’re working on to continually improve the website. I’d like to thank all of those individuals for their help to ensure the book is as accurate and up-to-date as possible. To be honest, I never imagined that I would write a book. Today, I am thankful for this wonderful opportunity. It has been a great learning experience to see the book through the whole process as a writer, and not only from the perspective of an editor (as I usually do in my freelance editing work). I hope that readers enjoy the book, and learn some new searching and record-browsing strategies to use so they, too, can find success researching their ancestors on FamilySearch.org.